One of the biggest myths in Laser Tattoo Removal is that a tattoo can be removed in one session. No tattoo will be able to be removed in one session. Even the smallest tattoo will take more than one session of laser tattoo removal. The only way to remove a tattoo in one session is to surgically remove it…This is an option as well at Lasting Looks Clinic in Toronto. That would require a consultation with our plastic surgeon. However if surgery is not an option then Laser Tattoo Removal is a process that requires the skin to heal between sessions. Usually 4 to 6 weeks. Your lymphatic system needs to process the unwanted pigment after a tattoo removal session to see any lightening of the tattoo. 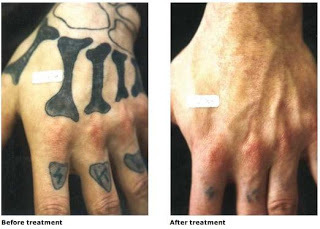 After each tattoo removal session the tattoo will lighten to a point of disappearing.